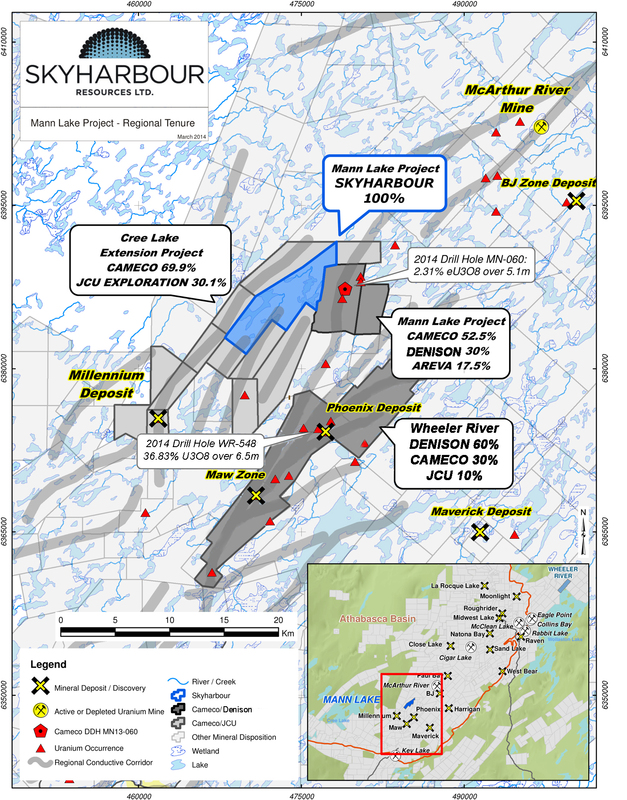 VANCOUVER, BRITISH COLUMBIA--(Marketwired - Dec. 16, 2015) - Skyharbour Resources Ltd. (TSX VENTURE:SYH) (OTCBB:SYHBF) (FRANKFURT:SC1N) (the "Company") announces that it has purchased the remaining 40% interest in its Mann Lake uranium project in Saskatchewan from Aben Resources Ltd. (TSX VENTURE:ABN). The 3,473 hectare property is strategically located on the east side of the Athabasca Basin approx. 25 km southwest of Cameco's McArthur River Mine and 15 km northeast and along strike of Cameco's Millennium uranium deposit. For the 40% interest in the property, Skyharbour has issued 1 million common shares to Aben as payment and now holds an undivided 100% interest in the project. 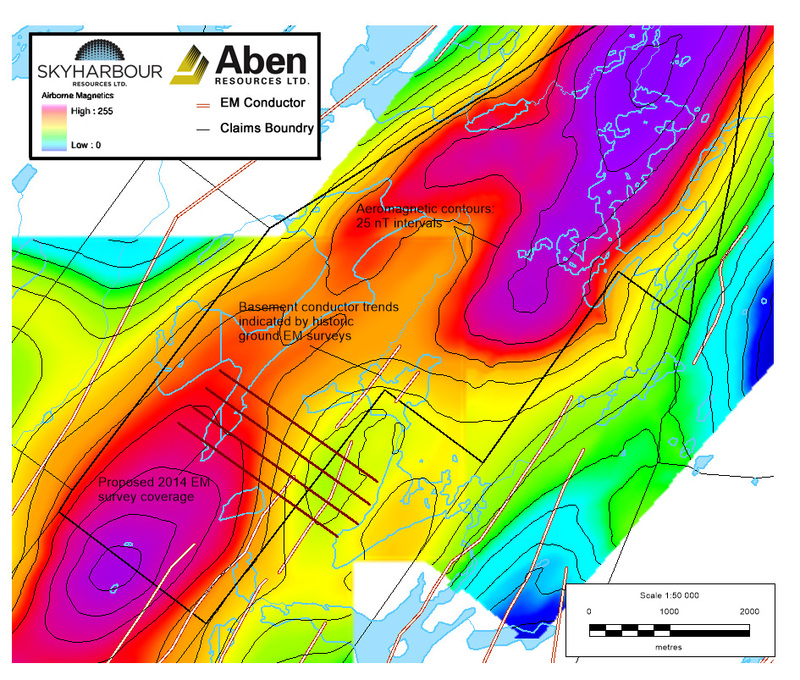 Aben has retained a 2.5% net smelter royalty (NSR) in the Mann Lake property with Skyharbour having the right to purchase 1.5% of the NSR for $1.5 million. Jordan Trimble, President and CEO of Skyharbour, stated: "Skyharbour's management believes this is an accretive deal for the Company's shareholders as we further enhance our portfolio of Athabasca uranium projects with drill ready properties in the Basin's most prolific areas. The Mann Lake Uranium Project boasts highly prospective geology and geochemistry, and robust discovery potential as identified by the historic work consisting of over $3.5 million in exploration expenditures, with additional work recommended on a number of untested drill targets. Of particular note is the property's strategic location southwest of the McArthur River Mine and adjacent to Cameco's Mann Lake Joint Venture with AREVA and Denison." Skyharbour holds interest in an extensive portfolio of uranium and thorium exploration projects in Canada's Athabasca Basin and is well positioned to benefit from improving uranium market fundamentals with four drill-ready projects. The Company owns a 100% interest in the Falcon Point (formerly Way Lake) Uranium Project on the east side of the Basin which hosts an NI 43-101 inferred resource totaling 7.0 million pounds of U3O8 at 0.03% and 5.3 million pounds of ThO2 at 0.023%. Skyharbour also has a 50% interest in the large, geologically prospective Preston Uranium Project proximal to Fission Uranium's PLS Project and Triple R deposit as well as NexGen Energy's Arrow discovery. 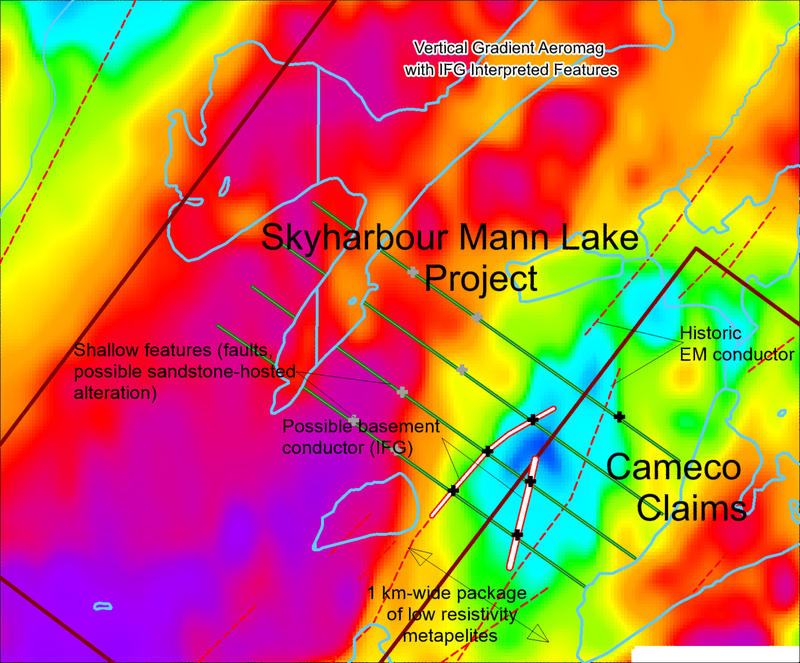 The Company's 100% owned Mann Lake Uranium project on the east side of the Basin is strategically located adjacent to the Mann Lake Joint Venture operated by Cameco with partners Denison Mines and AREVA where high-grade, basement-hosted uranium mineralization was recently discovered. Skyharbour's goal is to maximize shareholder value through new mineral discoveries, committed long-term partnerships, and the advancement of exploration projects in geopolitically favourable jurisdictions.